We have been supplying stainless steel IBCs to a variety of industries for many years now and we realise that each individual company and product requires a unique container. Therefore, we decided not only to sell the standard models for different industries, but to also offer tailor-made IBCs. For models without approval we can, for example, make dimensional changes and customised equipment to suit your needs. For stainless steel IBCs we have all sorts of accessories to choose from - different types of rapid fittings, insulation and heating plates, stirrers, washing systems, etc. Over the years we have been supplying stainless steel IBCs to all kind of industries from brewers & farm shops to pharmaceutical companies, chemicals and petrochemicals. 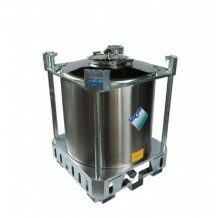 You also have the option between heated or cooled stainless steel ibc’s which makes it perfect for food ingredients. Stainless steel IBCs suit those in food manufacturing, the cosmetics and personal care industry, and the pharmaceutical and chemical industries. So if you need any type of stainless steel IBC container, please contact us and we’ll walk you through the whole process and modify the IBC to your needs. It doesn’t matter whether it’s a container for 100 litres or 1000 litres, we will find a solution for you.